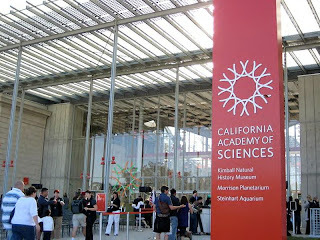 San Francisco's California Academy of Sciences Museum was constructed over a period of ninety years, and stands on the site formerly occupied by the Mechanical Arts Building of the 1894 California Midwinter International Exposition. 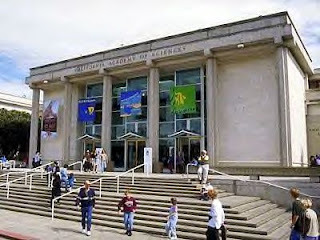 Founded in 1853, and originally named the California Academy of Natural Sciences, the museum occupied several other locations before permanently relocating, in 1916, to a new building in Golden Gate Park. Over the years, numerous additions were made to the museum, including an aquarium, science hall, and a planetarium. 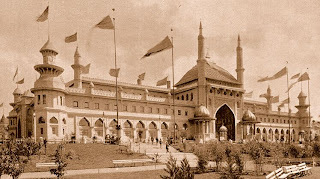 By the late 1980's the museum occupied a large complex of buildings, and contained countless exhibits. The 1989 Loma Prieta earthquake did significant damage to portions of the museum's buildings. After assessing the damage, a plan was ultimately conceived to construct a new state-of-the-art museum at the same location. 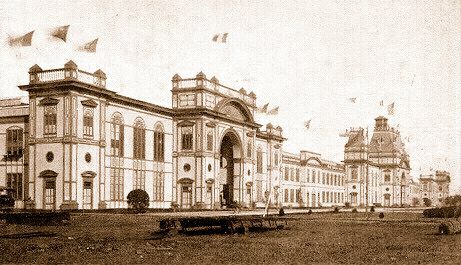 In 2003 the entire complex was demolished except for African Hall, which was constructed in 1934. The new building, which opened in September of 2008, uses much natural light throughout the exhibit areas. The building also features a unique "living roof", where California native plants thrive on 2.5 acres of open space, forty feet above the ground. This is odd! You also have Golden Gate Park's Music Concourse & California Academy of Sciences Museum in San Francisco, CA on this blog. I lived across the street from those 2 locations for 3 years in the 1980’s. Yep! Right there on Fulton. LOL!